The Islamic regime planned a May Day workers ceremony in front of the ex-U.S. embassy in Tehran, trimming the building with various signs such as ?Death to America? and ?Nuclear energy is our absolute right?. Hasan Sadeghi, the deputy secretary of the Islamic regime?s Workers House announced: ?On May 1st, international workers day, there will be a tributary ceremony in front of the ex-U.S. embassy.? Prior to the rally, a workers activist in Tehran commented: ?The Islamic regime is only looking to use this occasion to their advantage; it is entirely clear that they have every intention of stirring the ceremony in a direction that has nothing to do with workers. If they cared anything for the nations workers they would organize the ceremony in front of either Ahmadinejad?s offices or the Majles (the Islamic parliament?s assembly ? which is where workers protesting in Tehran have generally gathered to protest). The fact that Hasan Sadeghi has claimed that the workers issues will also be addressed is nothing more than a ruse.? The Organization of the Defense of Women?s Rights in Iran has also issued a statement in which they have stressed: ? The fact that the regime, in an attempt to repress a massive workers day protest organized by and for the workers, has boasted that the workers have in fact already organized a ceremony in front of the ex-U.S. embassy!! We women and men workers of Iran cannot be used by the Islamic regime for their propaganda and whims and we would like to declare that what we need is jobs, shelter, food?not nuclear weapons and fuel! If they spent the money and budgets on long-range missiles and nuclear bombs on helping revive bankrupted factories, creating jobs for us workers, the situation in the country would not be as deplorable and dire?the multitudes of unemployed workers and jobless youths would not be wondering the streets aimlessly and hopelessly. The cog wheels of the factories would have been operating and together, united, we would have made Iran prosperous.? So the real gathering of the workers took place not only in front front of the Social Security Organization in Tehran AND the the headquarters of the Greater Tehran Bus Company, many attended the regime's own rally in order to confront the regime's own authorities and to expose their hypocracy; according to reports from Tehran from people who were present at the rally between 18 to 20,000 people are said to have shown up. Workers from all across Iran made their way to Tehran to join in solidarity and though there was major security, controlled by the revolutionary guards and their basij auxiliary, the workers were not intimidated. The workers who had shown up at the ex-U.S. embassy due the Islamic regime's threats and intimidation of the loss of their jobs were meant to be nothing more than window-dressing for the Islamic regime's own self-promotion. They had been told to chant slogans about "nuclear power is our absolute right"; instead however, in defiance of their oppressors, they began chanting slogans such as: "Incompetent labor minister, resign, resign, strike, strike...is our absolute right" or "Imprisoned worker must be freed" or "Let go of the Palestinians and start thinking about us." At this point the regime's plans for a pro-regime seeming demonstration was dashed. Alireza Mahboob, the member of Majles (Islamic Parliament's Assembly) and the director of the regime-run organization entitled workers house whose recent embezzellment and financial scandals has made headlines even in the regime's own media, was planning on speaking at the rally but the crowd booed and jeered at him, barring him from speaking and forced him off the stage. Agents from the ministry of intelligence and security then arrested Gholam-Reza Mirzai, member of the board of directors of the bus drivers union who had been released on March 20th. The protestors chanted: "Osanlou must be released." Mansour Osanlou, the leader of the bus drivers union who is under severe torture in the prisons of the Islamic regime was arrested on December 23rd, 2005. The regime's anti-riot battalions that included 45 mini-buses, bullet proof cars and several motorcyles attacked the protestors from the bus drivers company, arresting 30 or more people. There were also many student supporters from various universities around Tehran who had, as planned joined the rally and some were seen being arrested along side the workers. 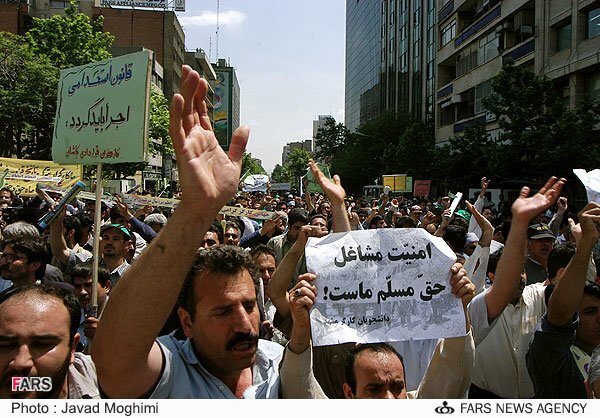 ILNA, the regime's own news agnecy reported: "Though the rally and march commemorating May day came to an end and many workers groups who had gathered at the regime's own ceremony on Taleghani Avenue (in front of the ex-U.S. embassy), the workers still went on chanting slogans such as: 'Faithless leaders what happened to the blood of the martyrs?' and 'Death to this life that is filled with so much shame' and 'The rule of the justice of their Imam Ali and so much injustice'."